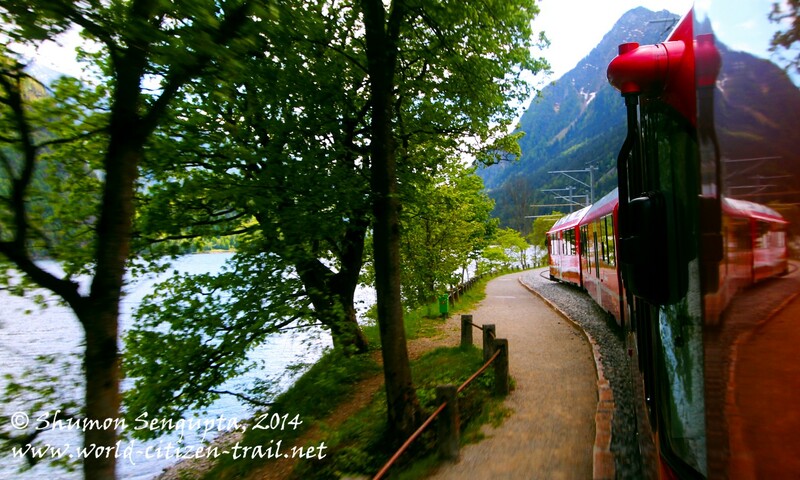 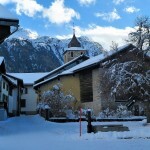 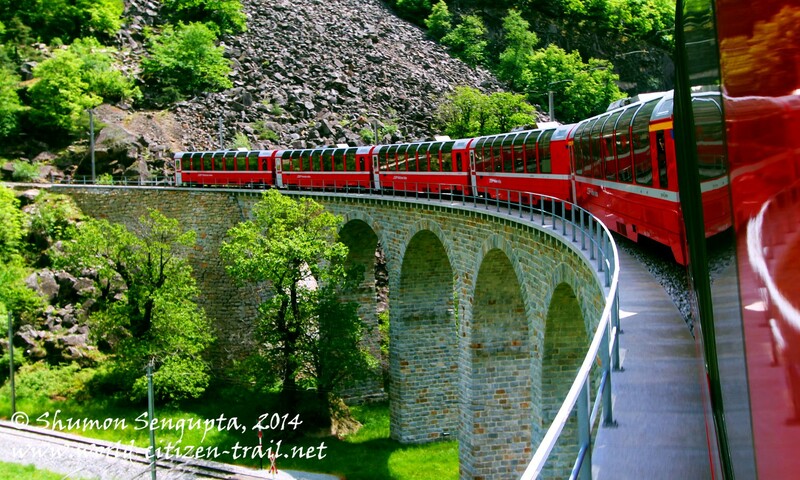 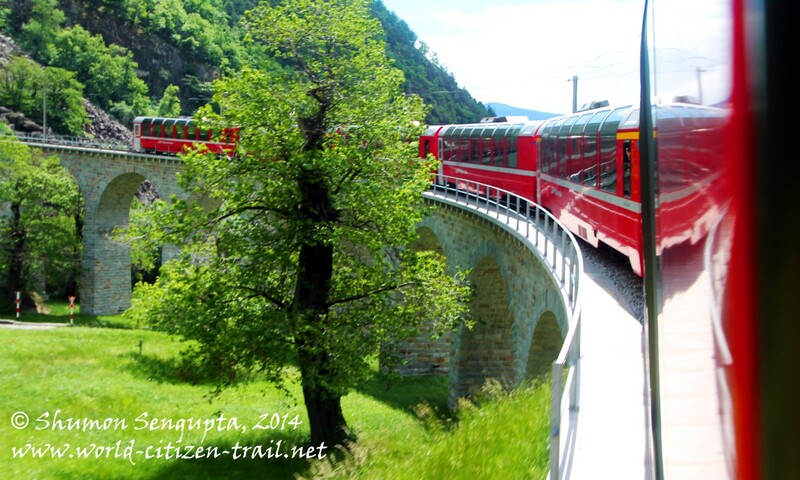 Run by the Rhaetian Railway from Chur (in the Graubunden Region in Switzerland) to Tirano (in Italy, bordering Switzerland), the Bernina Express traverses the historic Albula and Bernina Lines. 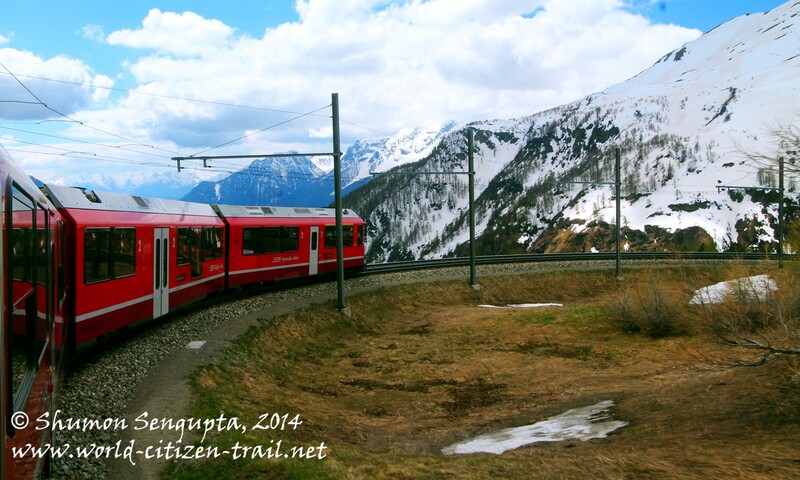 One of the most spectacular and dramatic ways to cross the Alps, this single track meter gauge railway provides and an incredible Alpine experience. 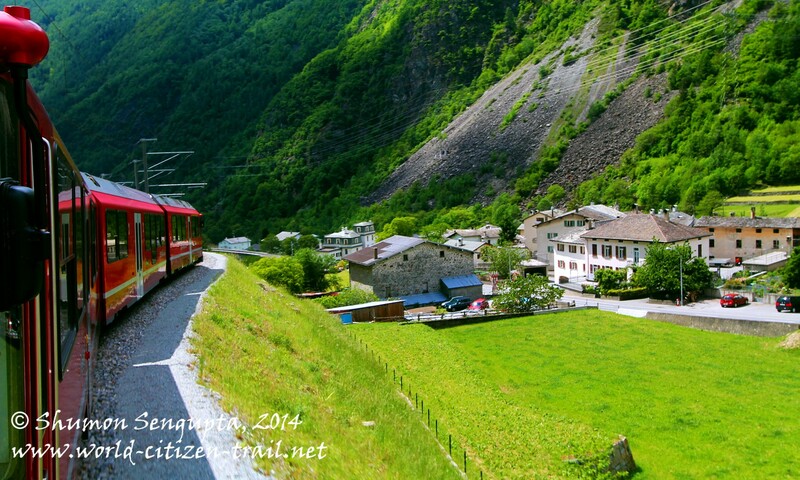 It is the highest adhesion railway in the Alps and one of the steepest adhesion railways in the world. 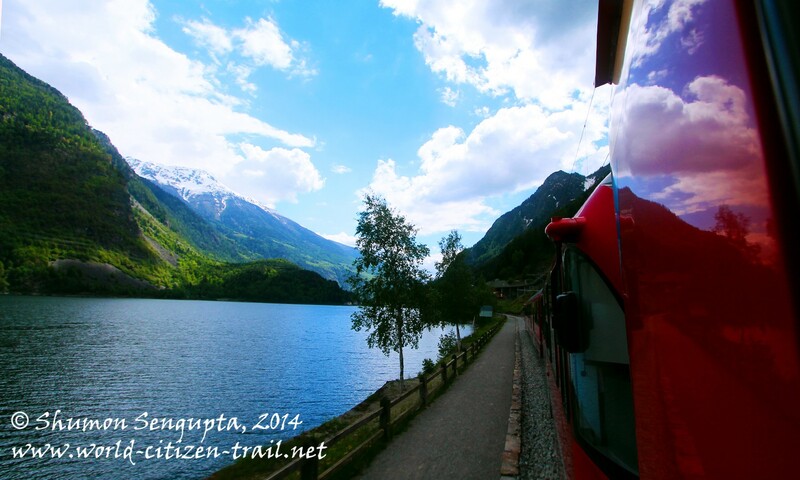 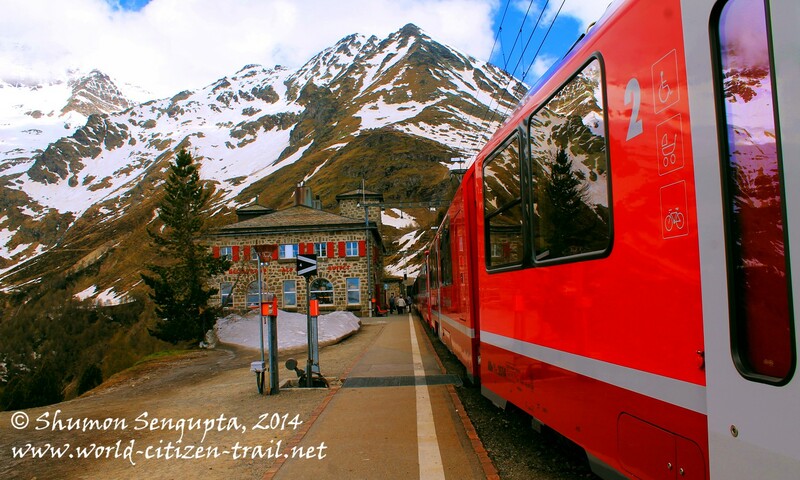 The Bernina Express is one of the handful trains in the world to be designated by UNESCO as World Heritage. 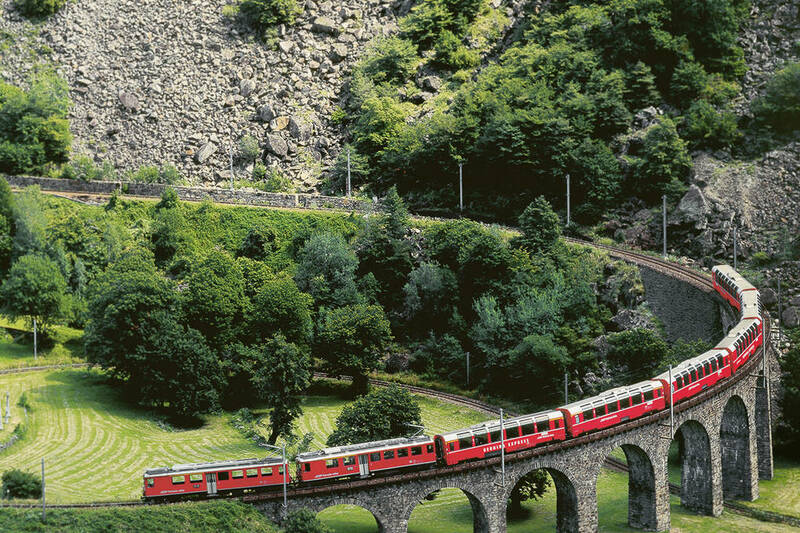 Connecting the northern part of Switzerland with the southern part, the Bernina Line negotiates some of the steepest gradients (up to 70% incline) without a rack-and-pinion (cog rail) system. 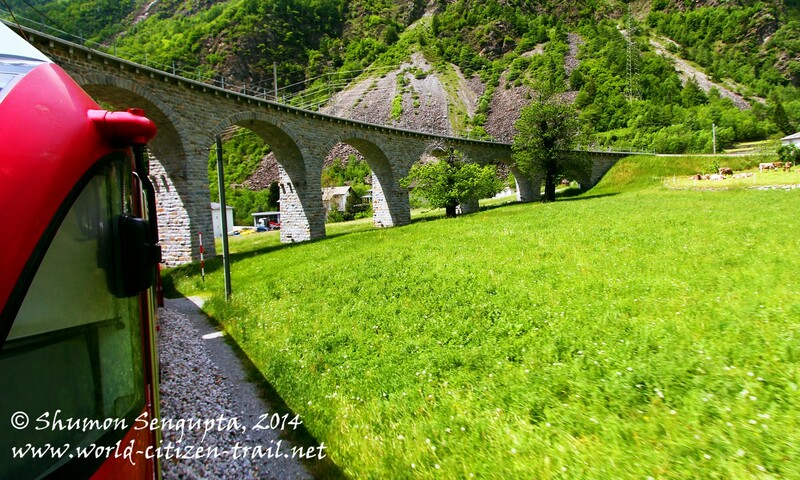 Over its four hour journey, it runs through 55 tunnels and over 196 bridges and viaducts. 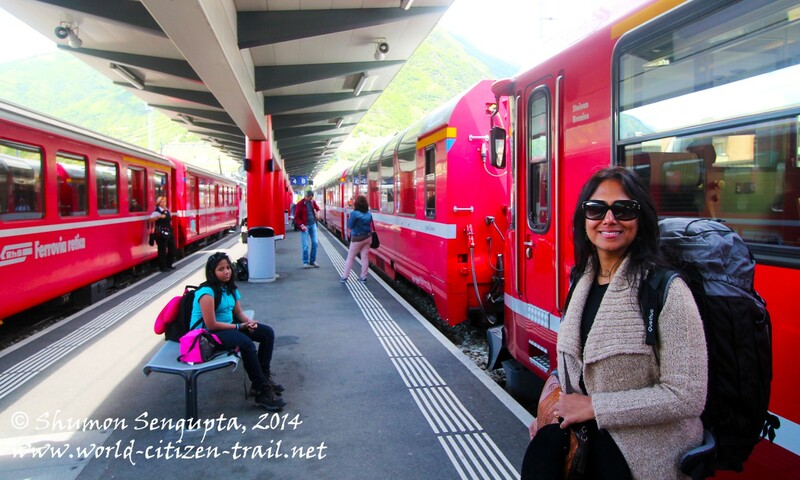 In my previous post, I had mentioned about our spectacular journey between Chur and Alp Grüm, by this fascinating train. 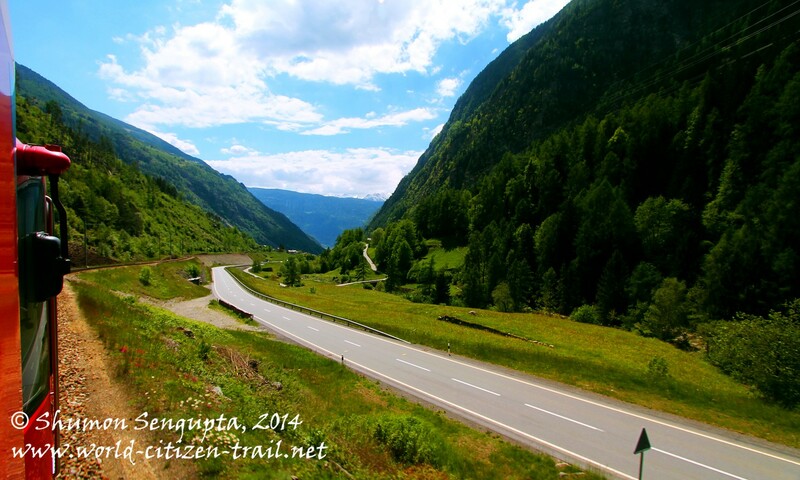 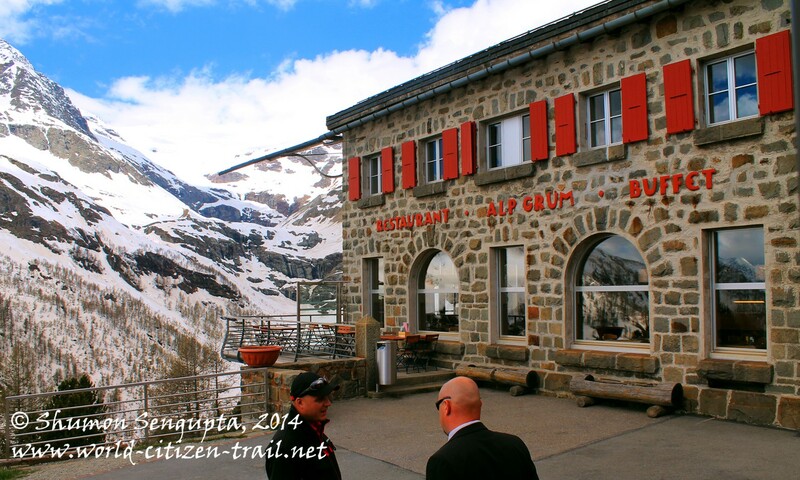 In this post, I shall briefly describe our journey from Alp Grüm to Tirano, as much of that is possible, for what we experienced was way beyond what mere words and photographs can express. 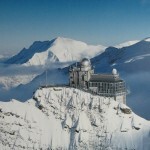 Alp Grüm (6,860 feet) is situated right below Mount Palü (12,795 feet) and its glacier and it is the first station to the south of the Alps. 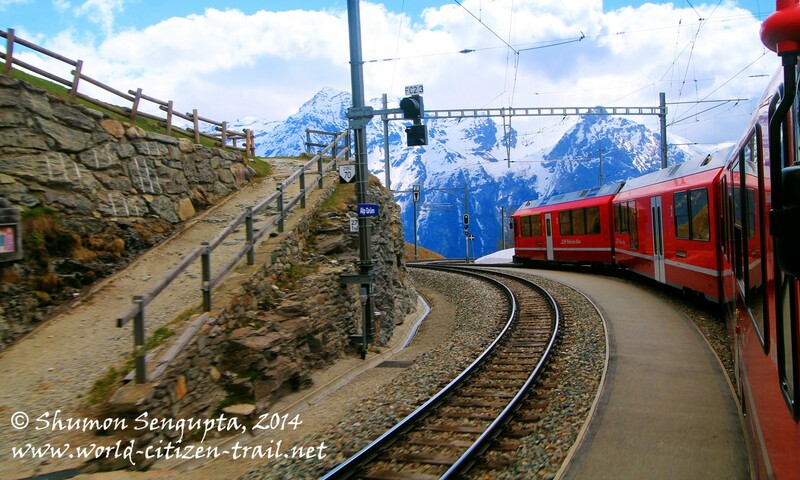 We had a 20-minute halt at the Alp Grüm station, where we got off to admire the surrounding alpine scenery. 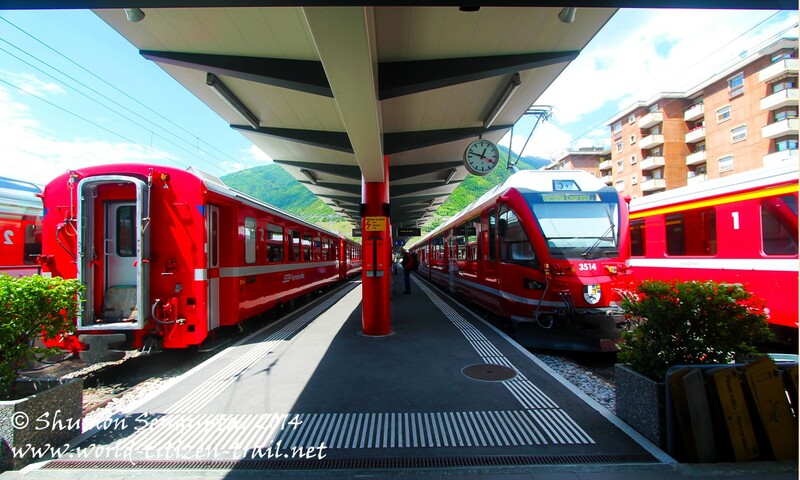 The tiny station is incredibly romantic. 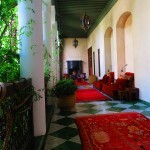 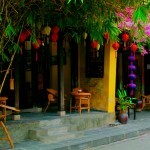 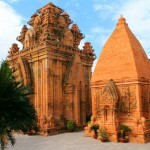 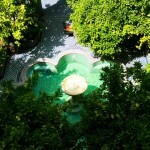 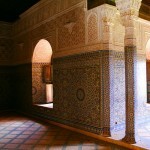 Built of stone, it has a beautiful hotel and restaurant next to it. 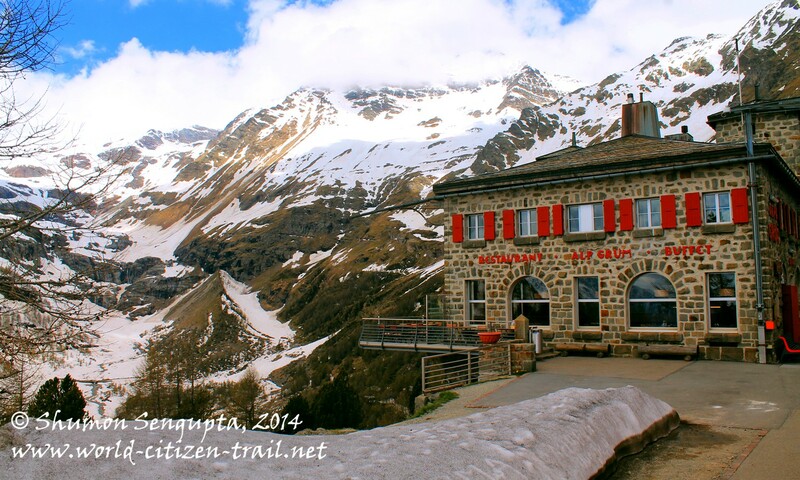 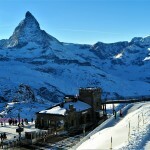 The restaurant has an amazing terrace shadowed by towering mountains and overlooking the Glacial Lake, down below. 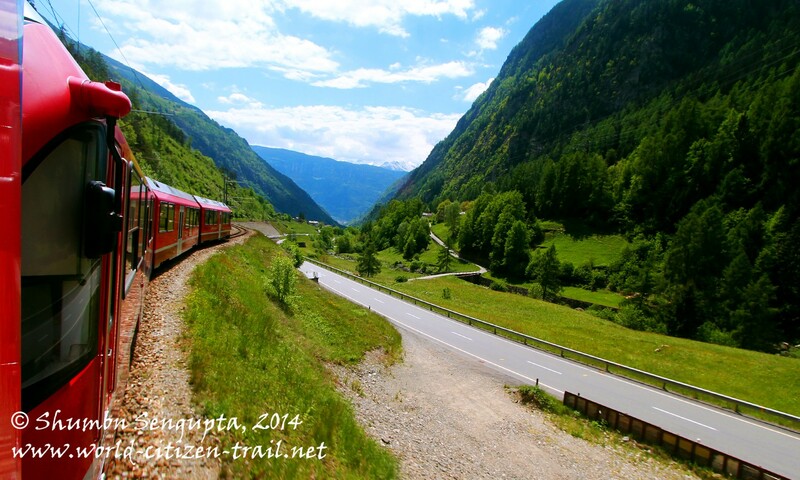 Almost immediately after our train left the Alp Grüm station, it descended gently, taking a sharp left hand turn along the edge of the cliff and then taking a sweeping right turn, following a tight 180 degree curve, passing below the towering mountain of Alp Grüm. 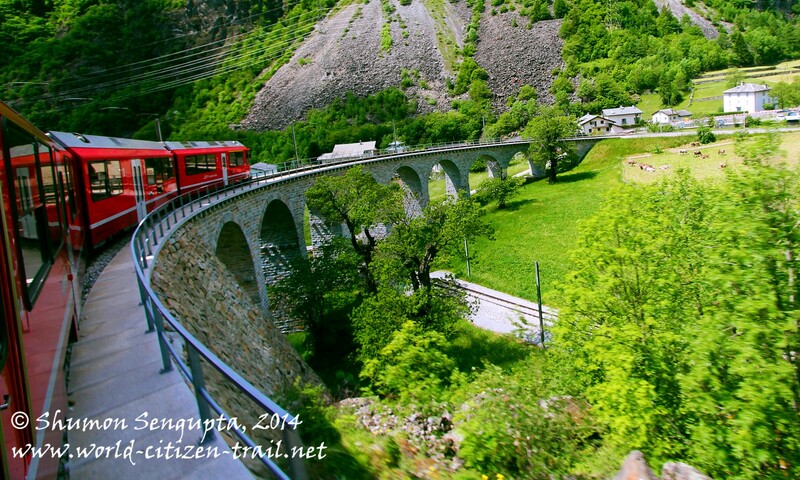 Further ahead, the train took seven tight curves /hairpin bends and spiral tunnels before reaching the Cavaglia station (5,554 feet), located high above the valley of Poschiavo. 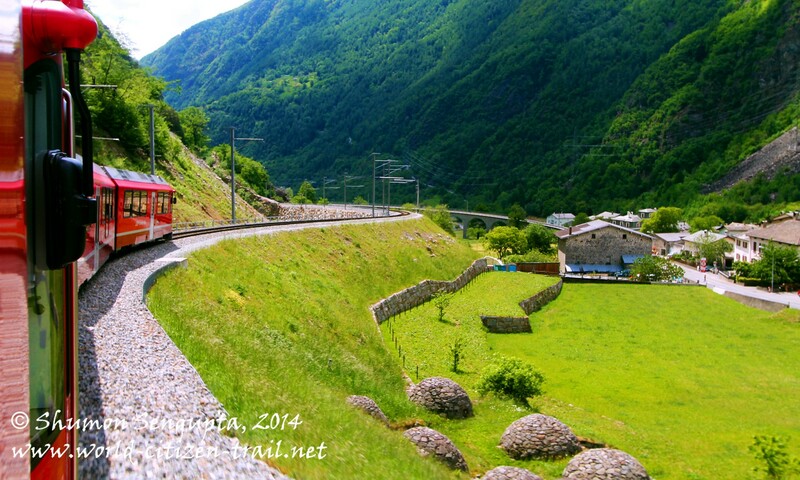 From Cavaglia, the train descended steadily along more hairpin bends down to Cadera and then to Privilasco. 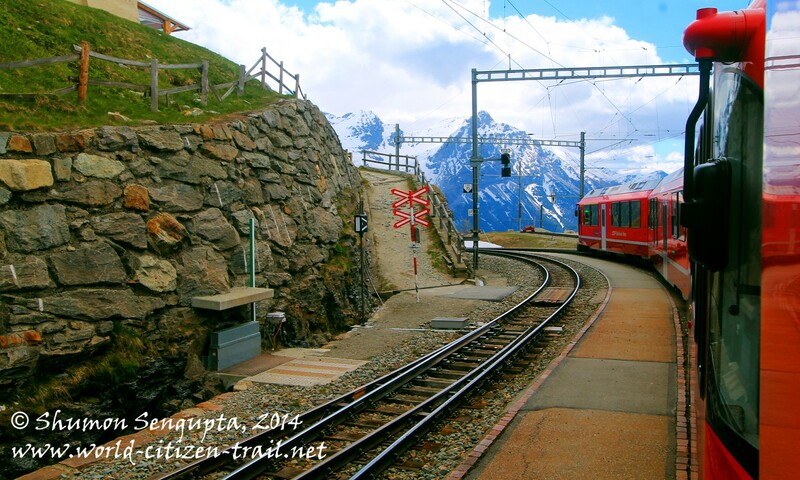 From Privilasco, the train then descended to the Swiss Italian speaking town of Poschiavo (at 3,326 feet), along a fairly straightforward but steep gradient, past chestnut forests. 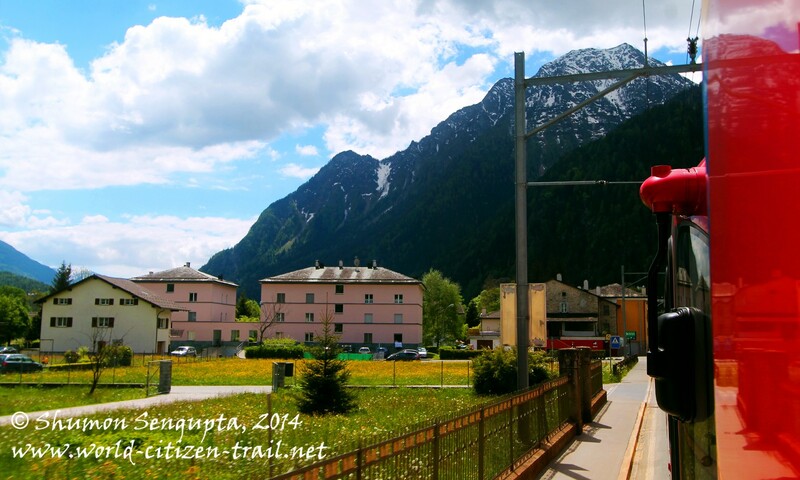 Between Alp Grüm and the town of Poschiavo, our train negotiated approximately 3,281 feet difference in altitude over a distance as short as 5kms, as the crow flies. 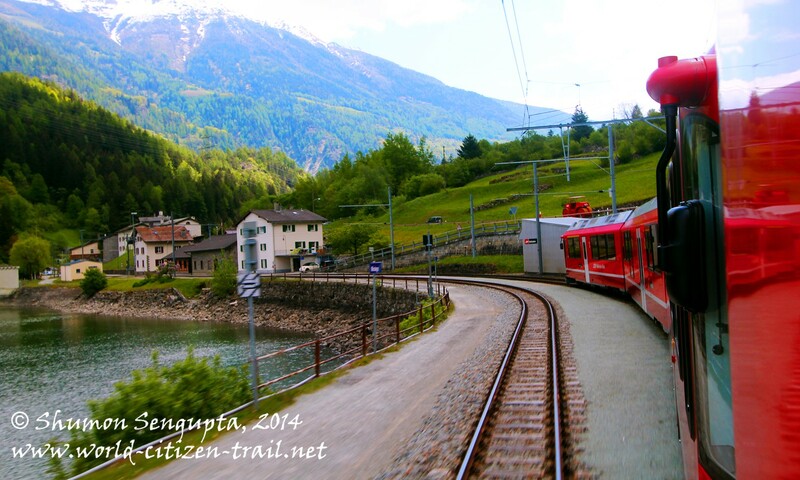 After Poschiavo, the train stoppd briefly at Le Prese and then at Miralago, passing along the banks of the Poschiavo Lake. 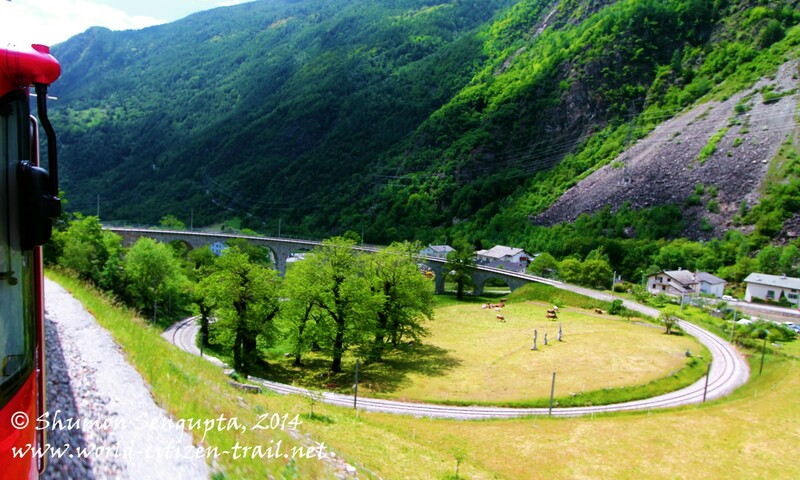 From Miralago, the track then descended towards Brusio (2,559 feet), taking a full 360 degree loop over the iconic Brusio Viaduct. 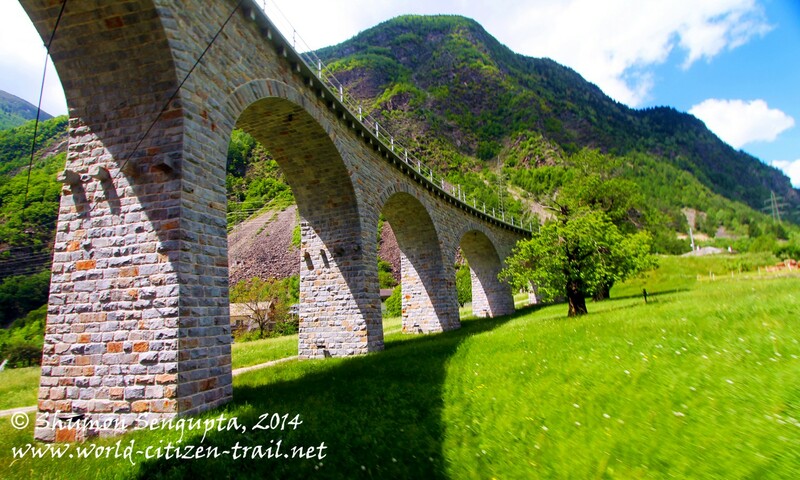 The sole purpose of the picturesque spiral viaduct – a beautiful example of bridge engineering – was to help reduce the altitude of the track almost vertically. 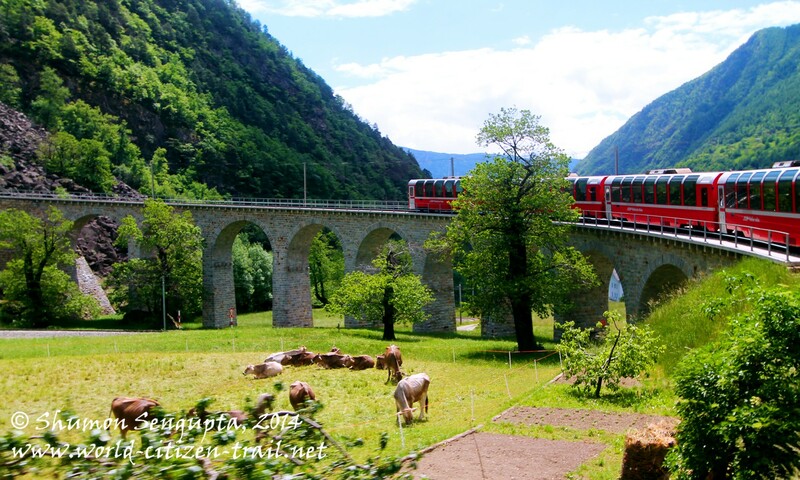 The Brusio Viaduct takes a full 360 degree turn and loops under itself, which technologically not the most challenging, nevertheless provides a picture postcard image. 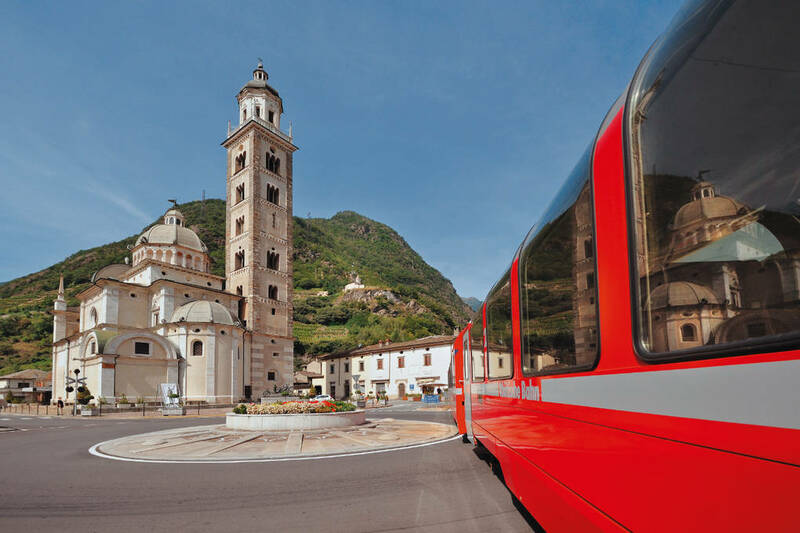 After leaving Brusio, the train stopped briefly at the Swiss-Italian border at Campocologno (1,748 feet), before ending its journey in the town of Tirano (1,410 feet), in the Italian province of Sondrio. 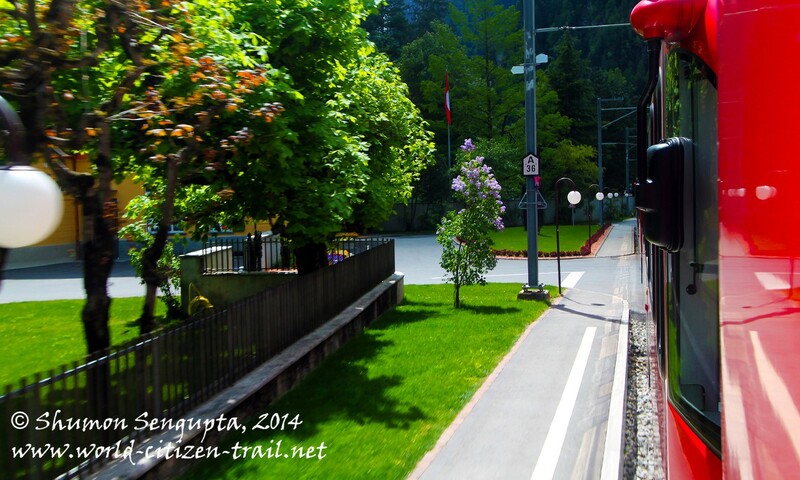 After Campocologno, we were fascinated to note that for about 3 km, our train had practically becomes a tramway, traveling at level of the road along sunken tracks, sharing the road with motor vehicles. 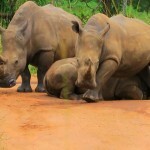 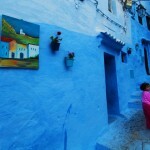 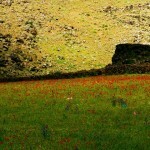 The contrast was most unexpected and couldn’t have been more remarkable. 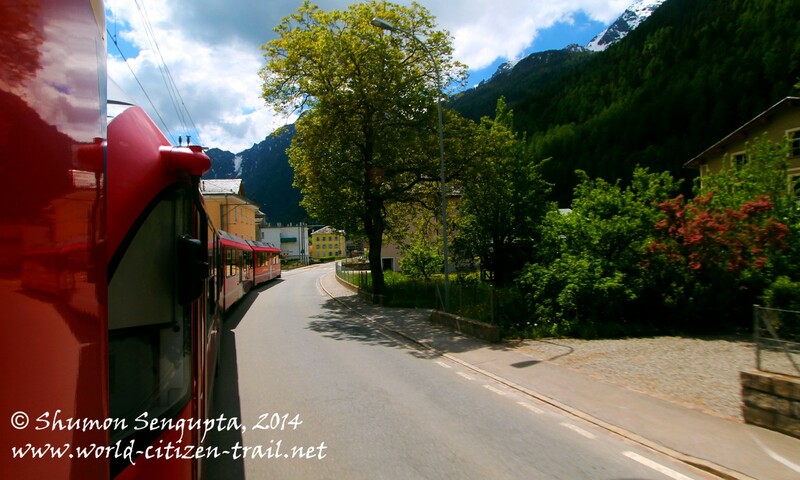 What was a mountain train a little earlier had suddenly transformed into a slow moving a city tram. 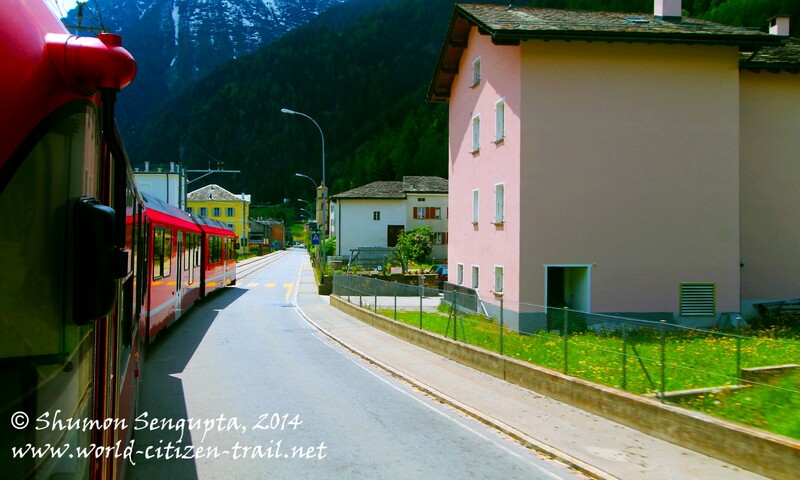 Our train, which felt more like a city tram than a train, meandered alongside and at many places right through the middle of the road, sharing the road with vehicular traffic, snaking through little towns, almost within arm’s distance from the houses lining the road and the sunken track. 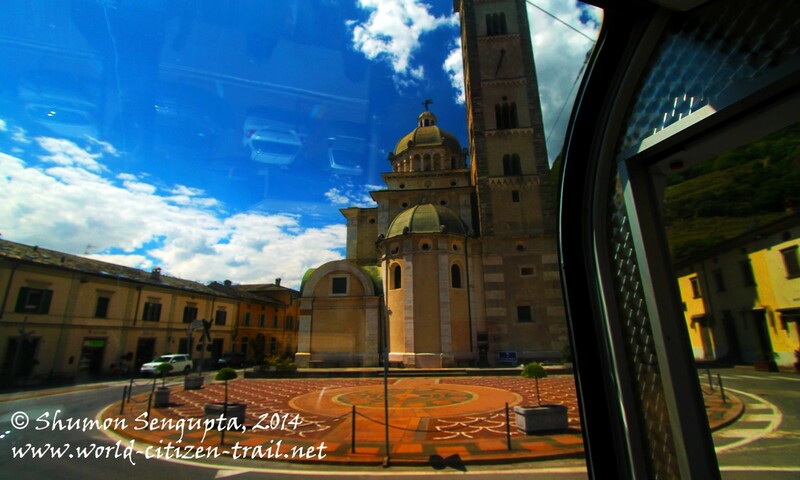 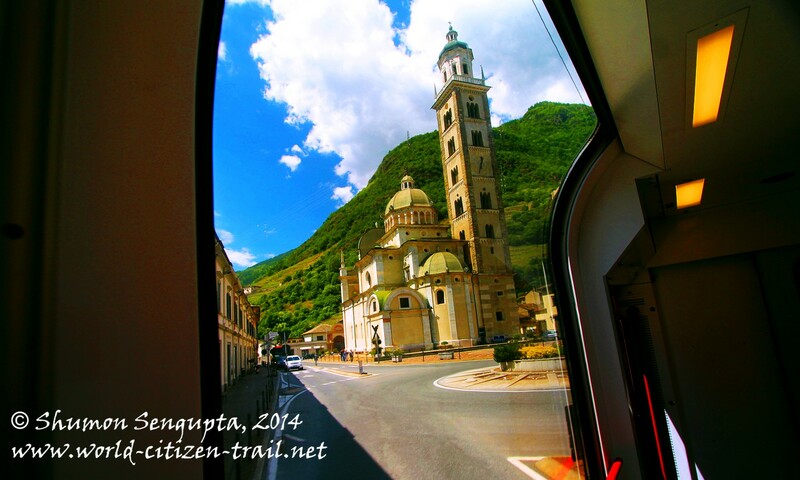 Just before arriving at Tirano train station, our train passed by the impressive Tirano Basilica. 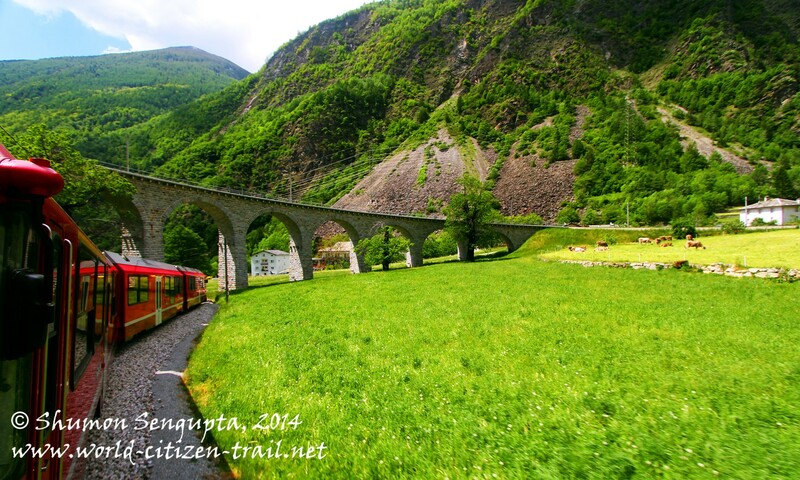 Between Chur and Tirano, the Bernina Express covered 61 mind blowing kilometers of mountain railway, created as an outcome of outstanding and pioneering feats of mountain engineering and architecture. 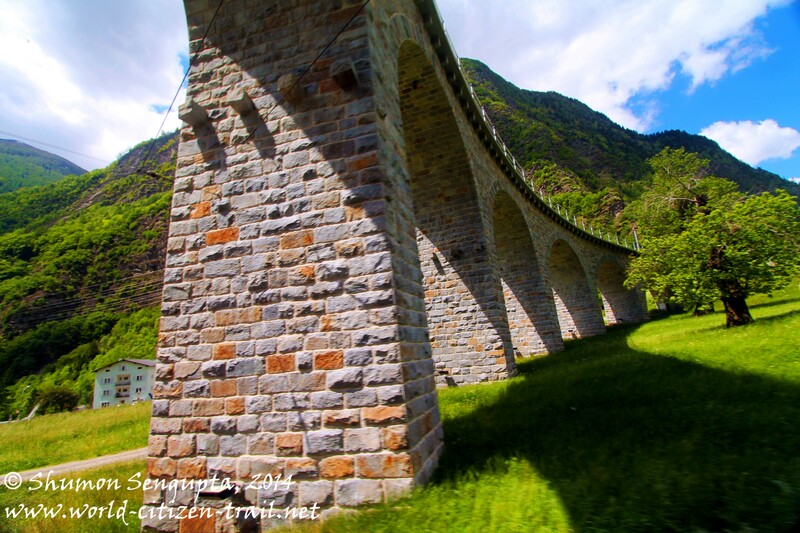 Starting from Chur, out train journey lead through the Domleschg valley, via the soaring 90-meter high, iconic Landwasser Viaduct (mentioned in my previous post), through meandering spiral tunnels of the Albula valley, into Bergün and then into Pontresina. 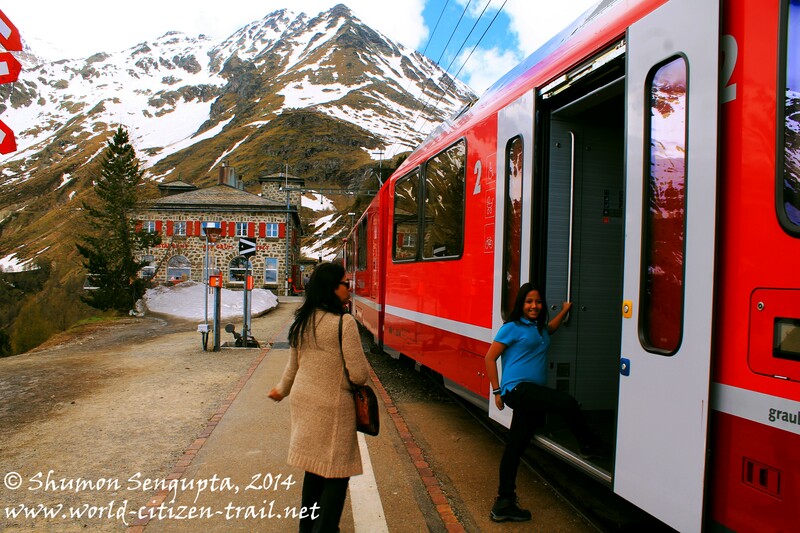 The Bernina Express then traveled along narrow valleys, over towering viaducts built across deep gorges, under the shadows of soaring mountain peaks, past massive glaciers, awe-inspiring rock formations and through the highest railway transversal tracks in the Alps in the Bernina Pass. 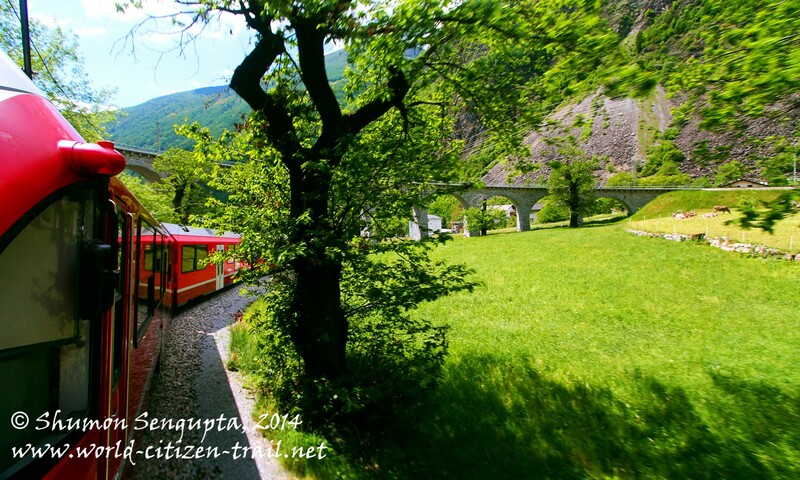 Having reached its highest point in the Swiss Alps, the train then steadily descended to the warmer southern valleys of Switzerland, before entering the into the region of the Swiss – Italian border and eventually into the town of Tirano, in Italy. 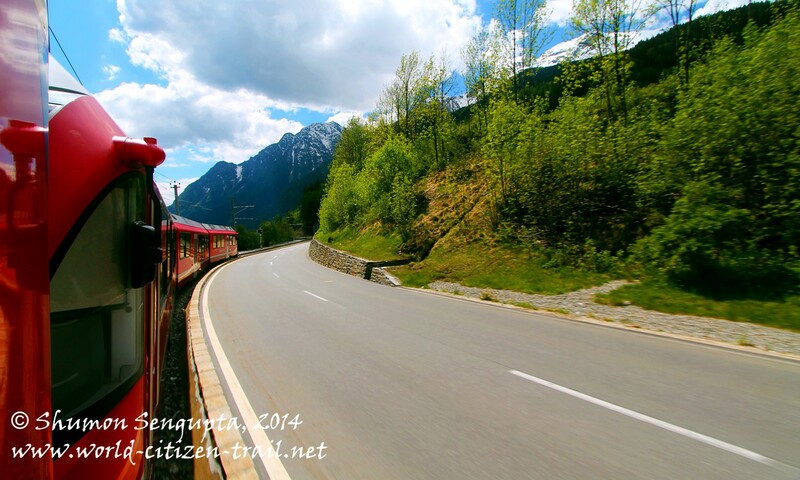 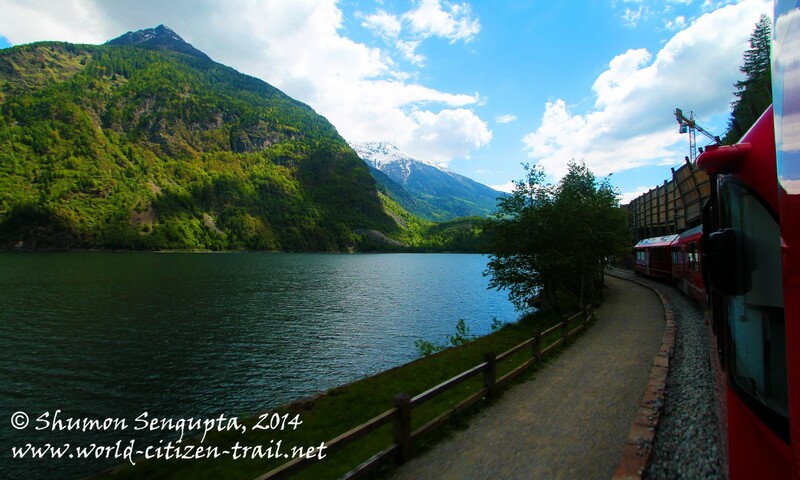 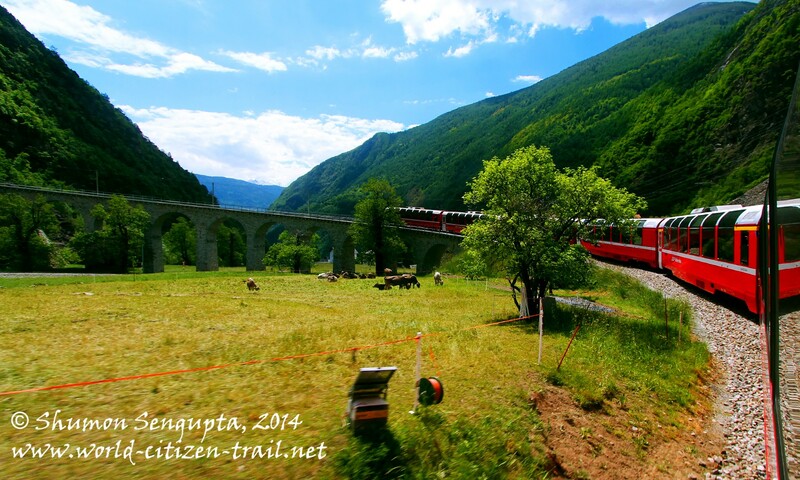 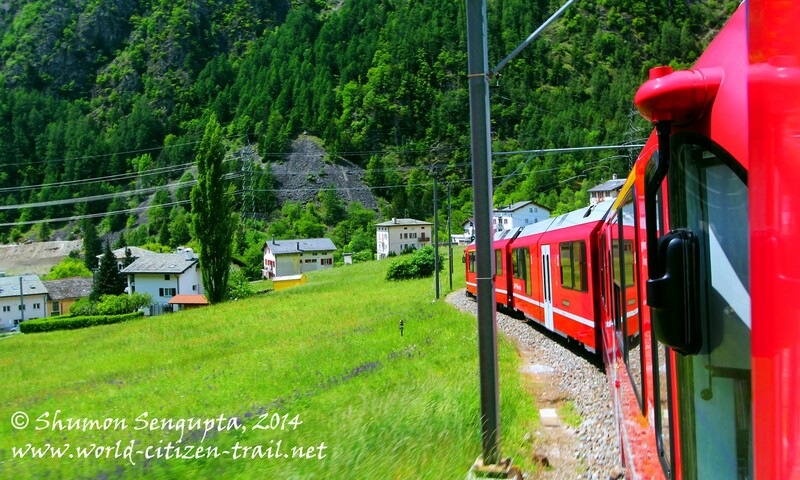 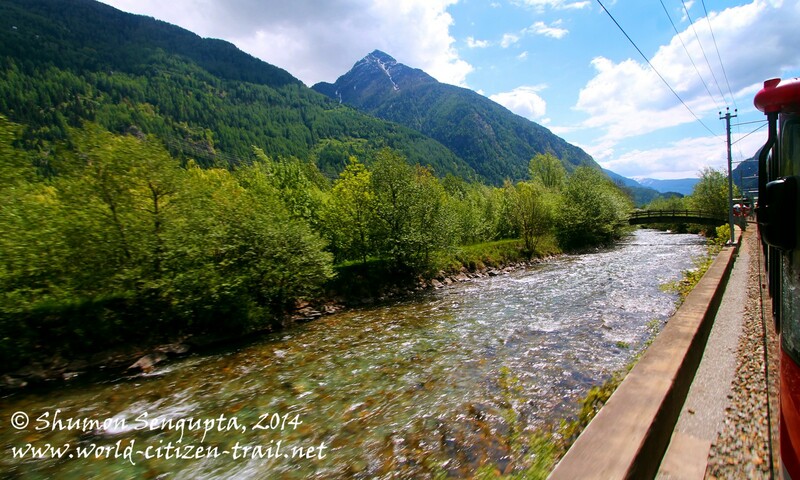 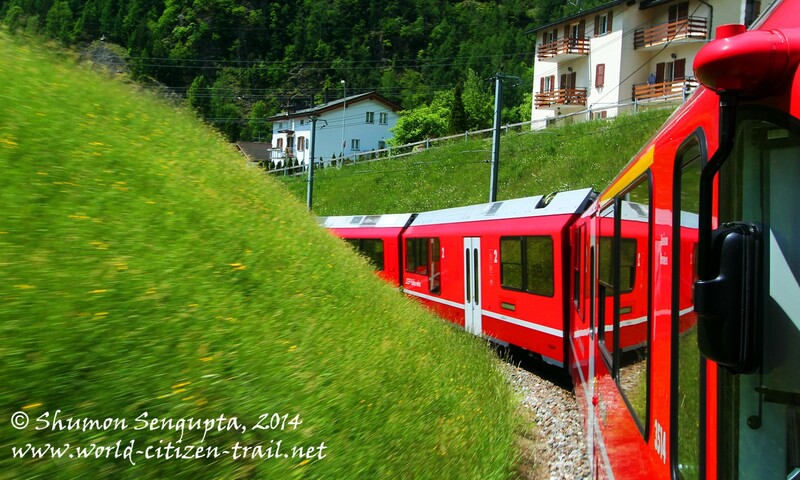 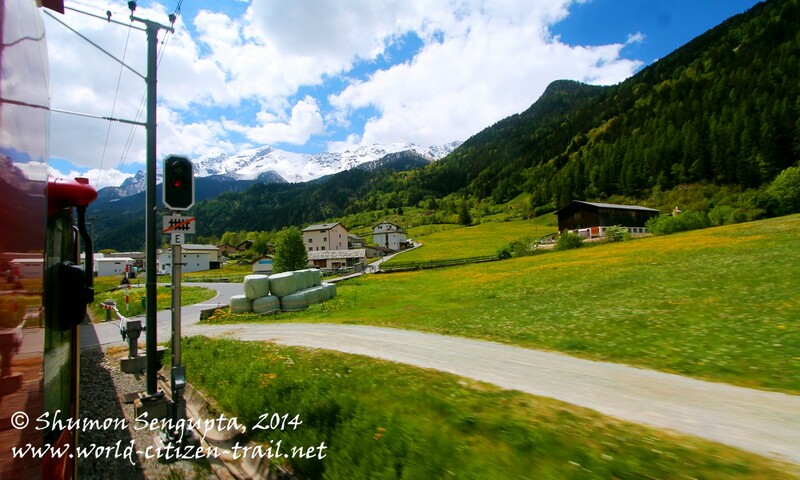 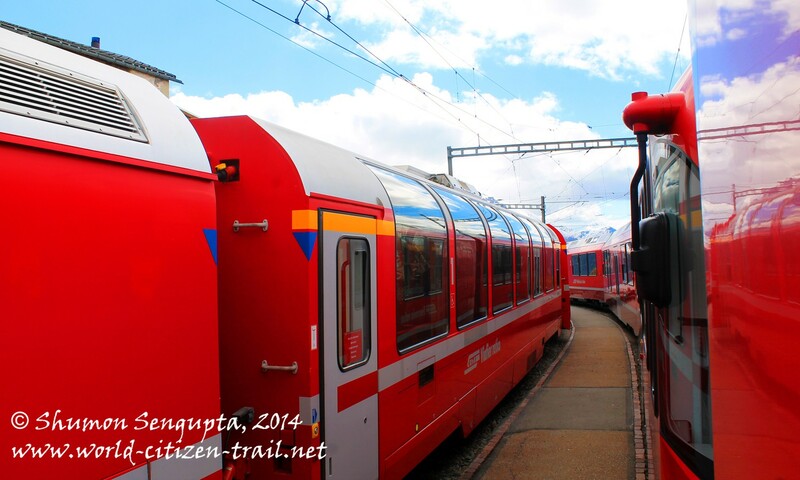 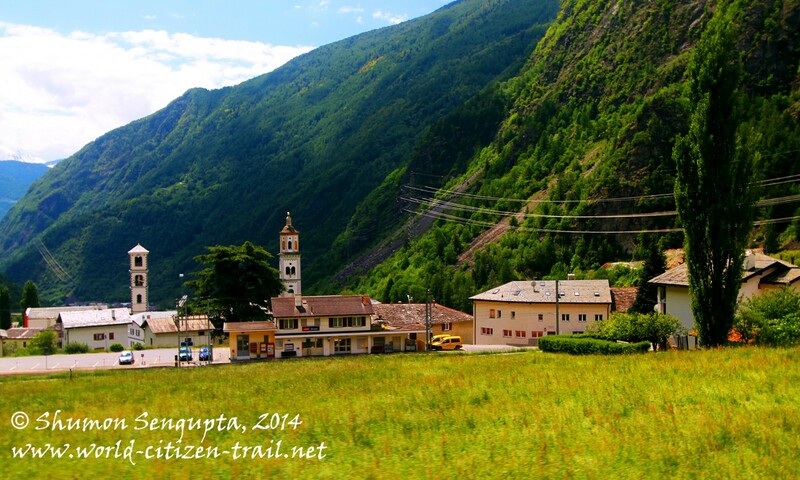 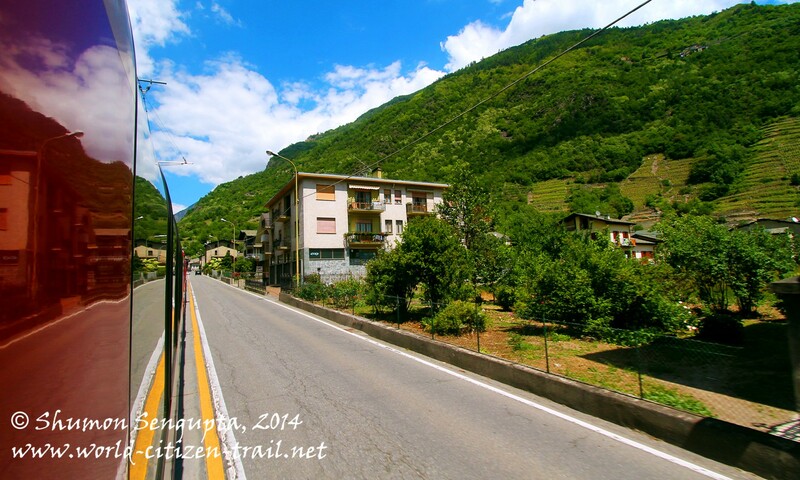 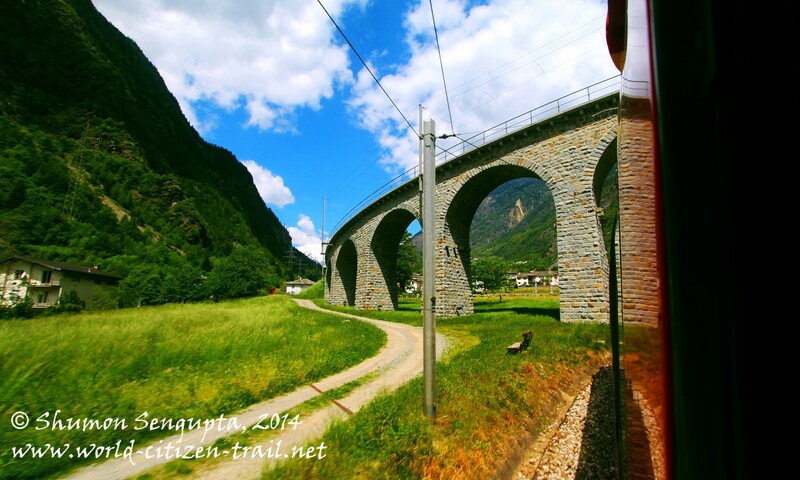 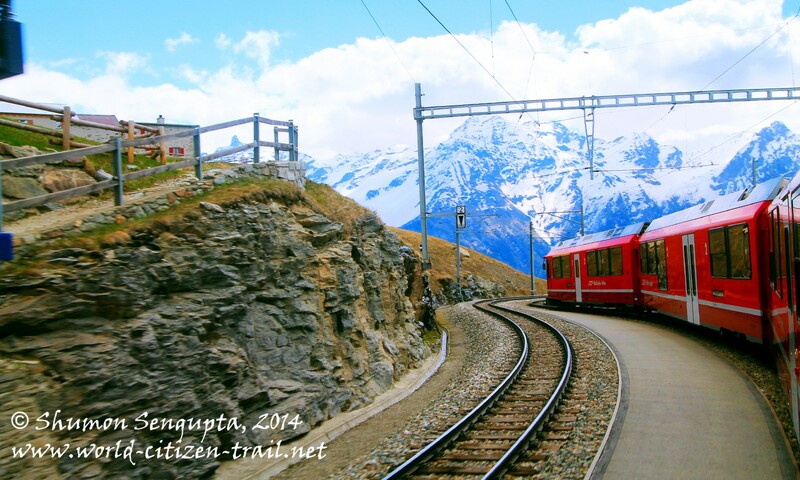 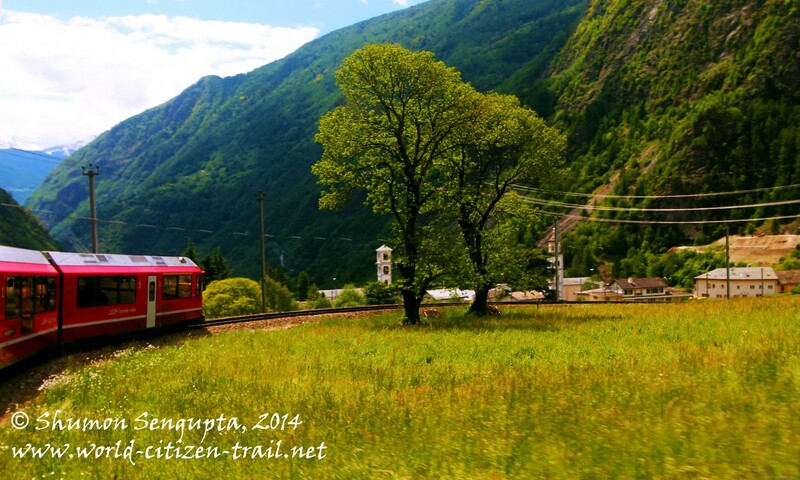 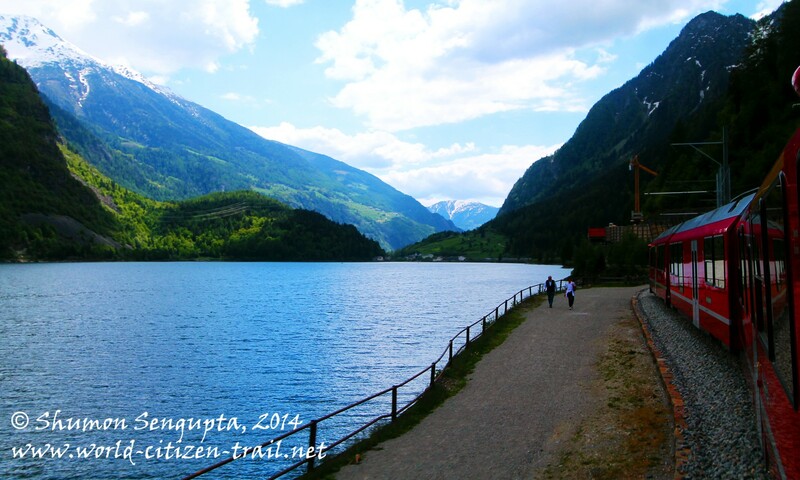 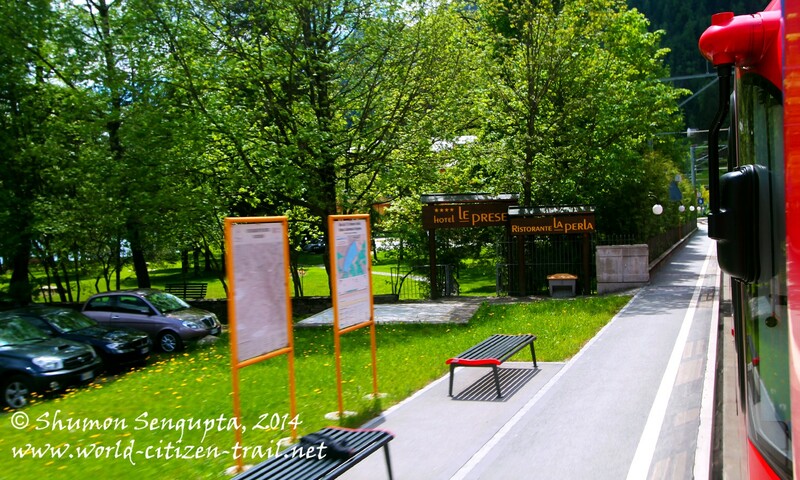 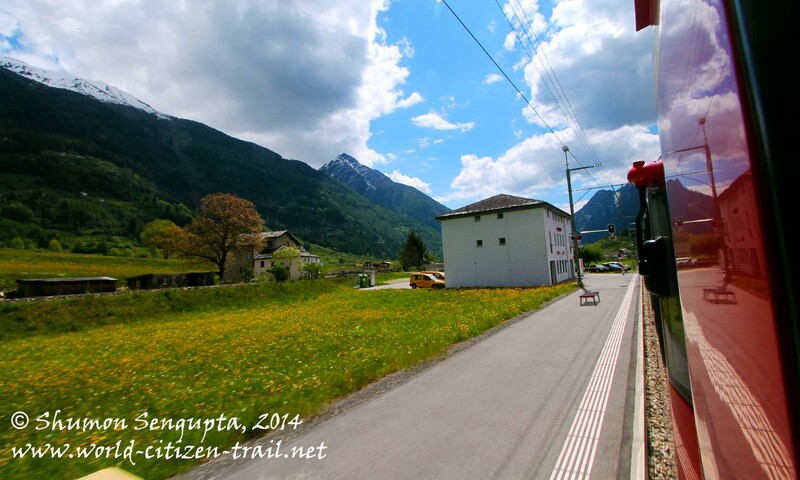 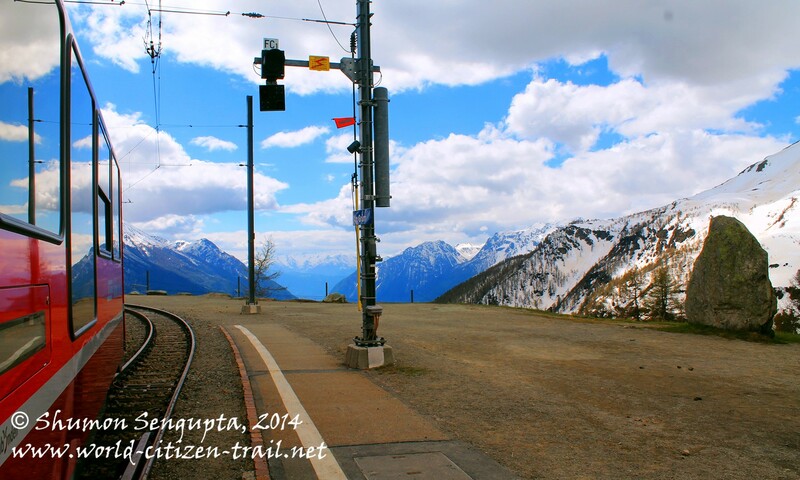 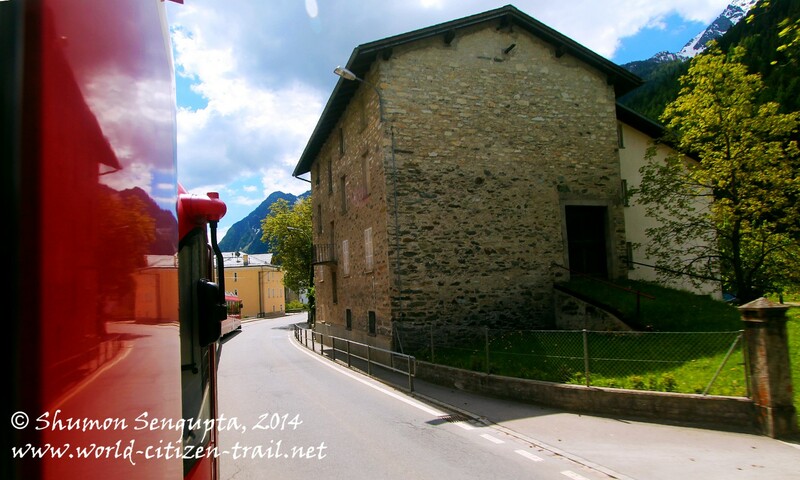 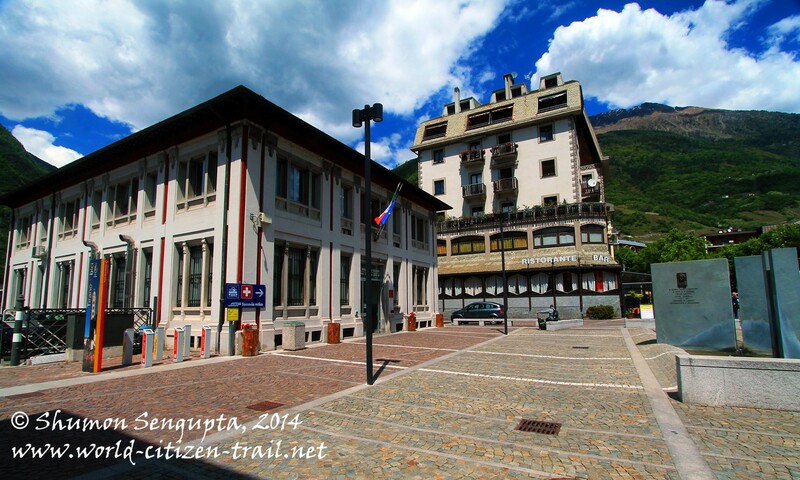 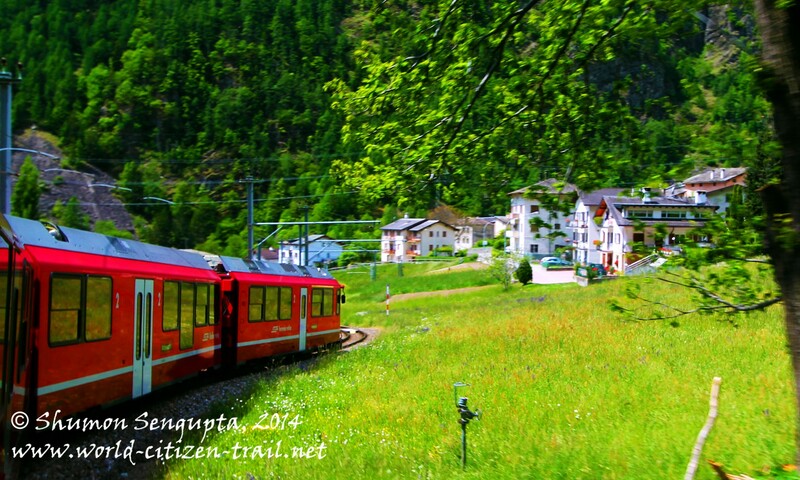 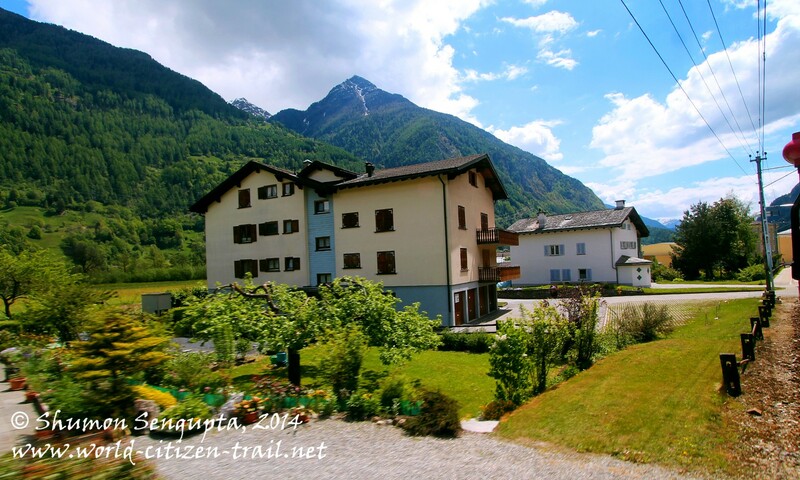 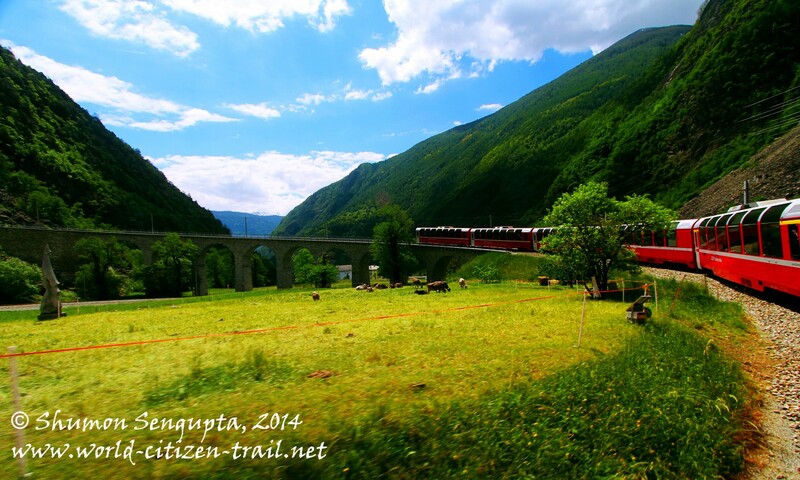 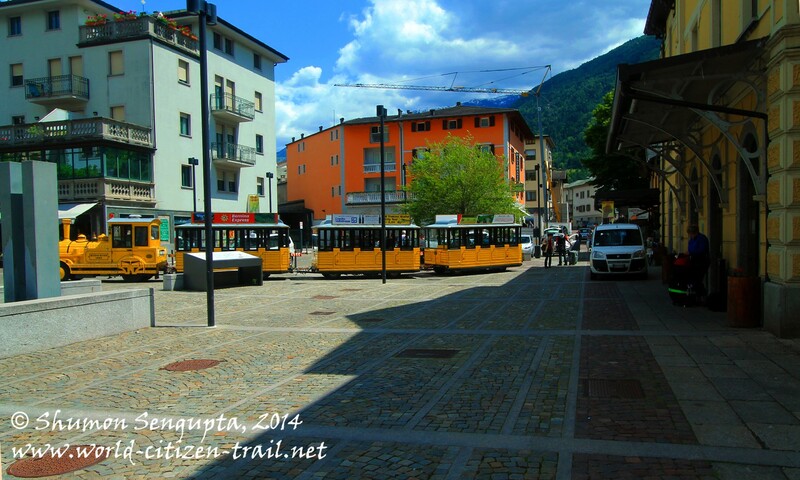 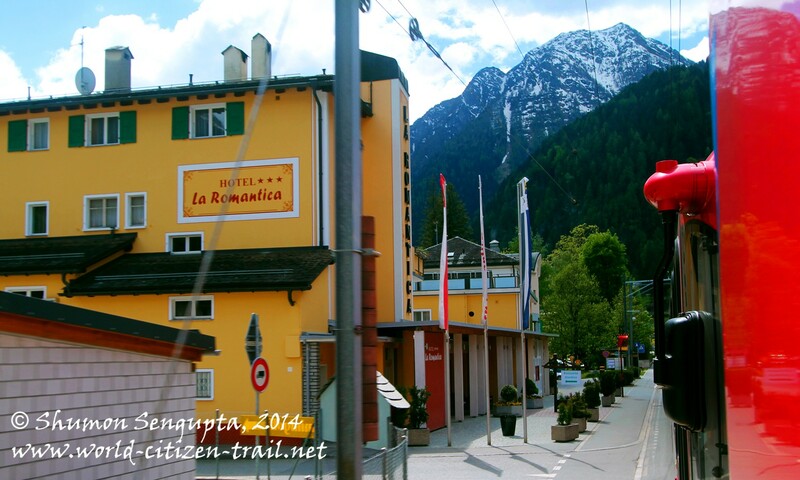 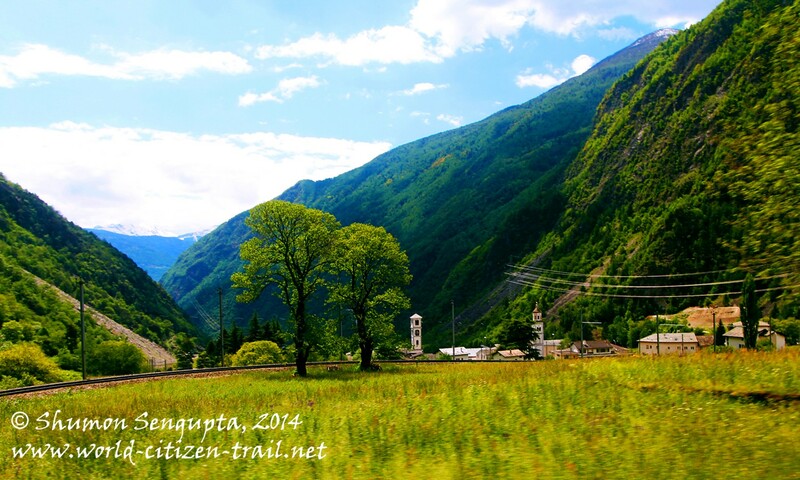 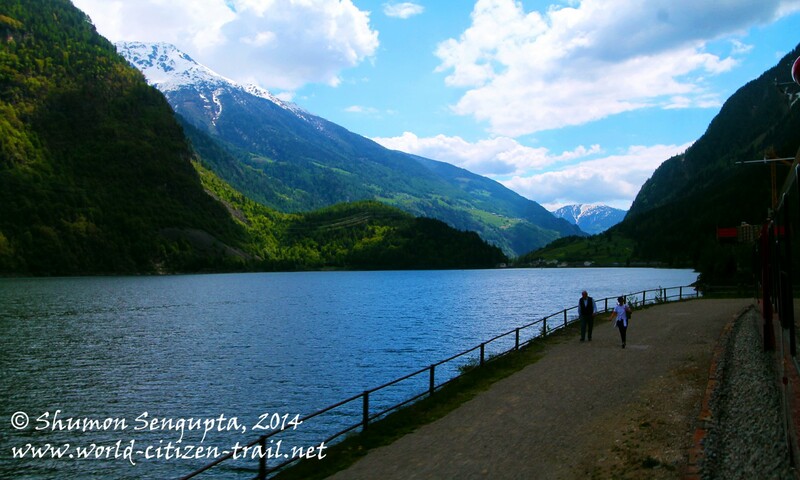 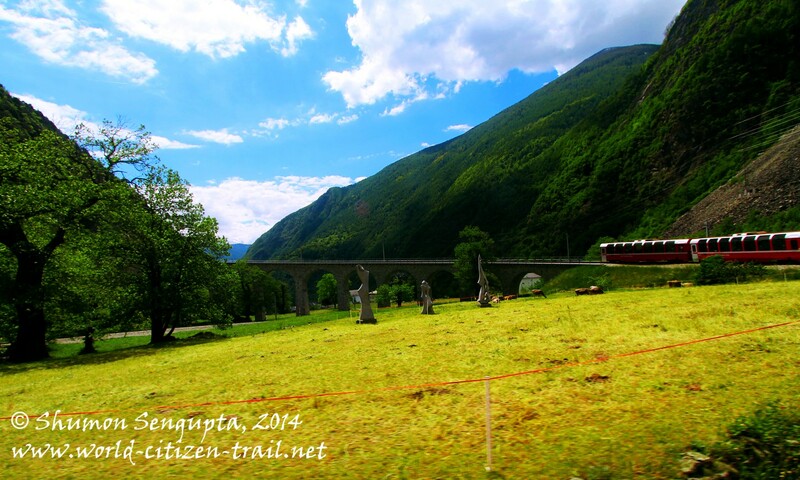 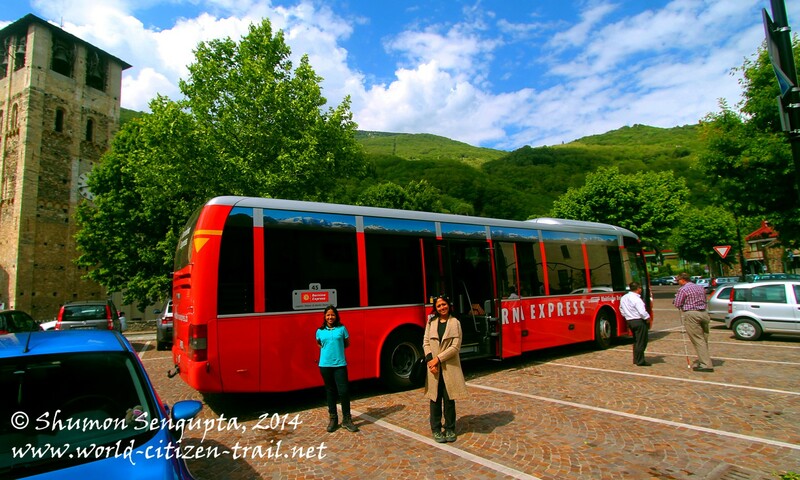 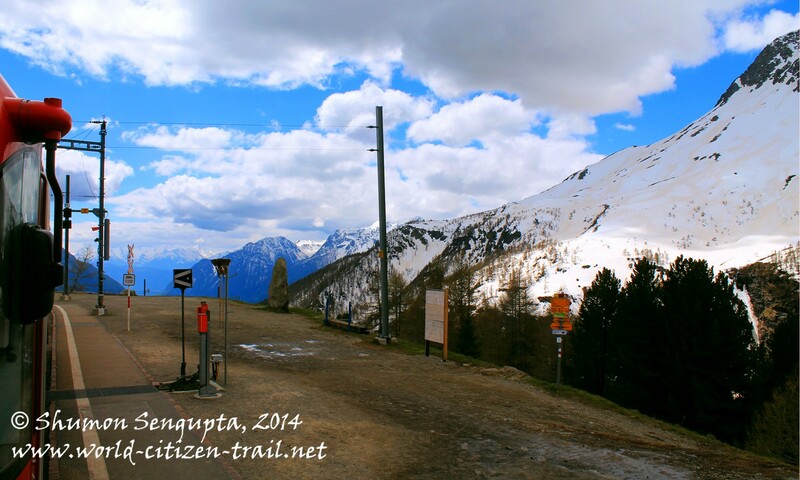 After arriving at Tirano, we explored the area near the railway station. 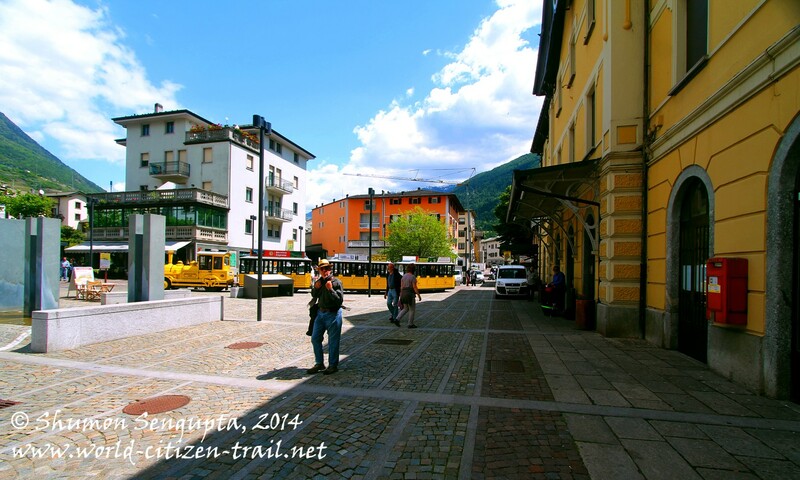 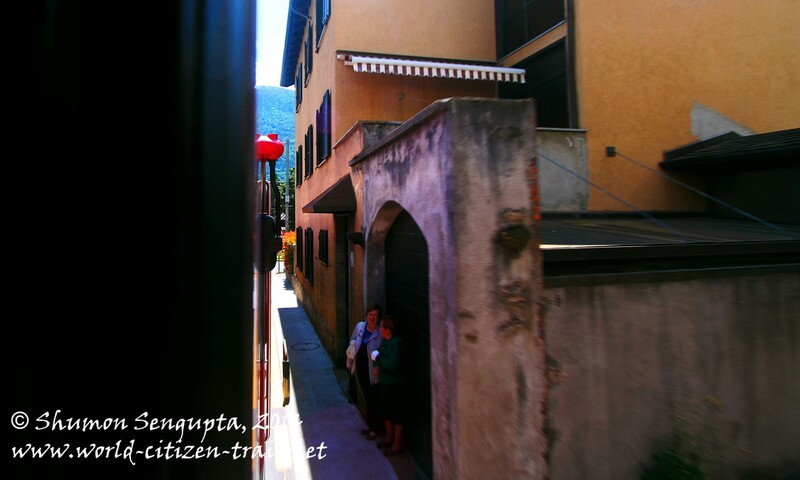 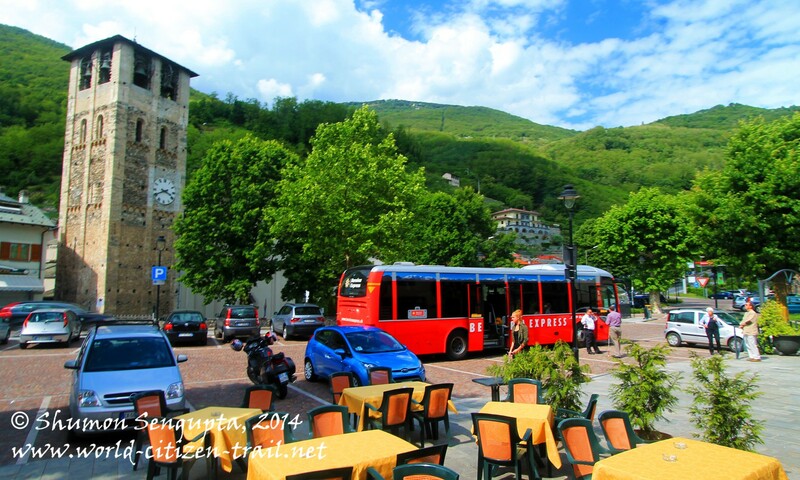 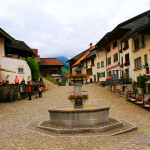 From Tirano, we then took the Bernina Bus, through the Veltlin valley (famous for its wine) in Italy, through incredibly picturesque Italian villages and small towns along lake Como and Lake Lugano, into the city of Lugano back in Switzerland. 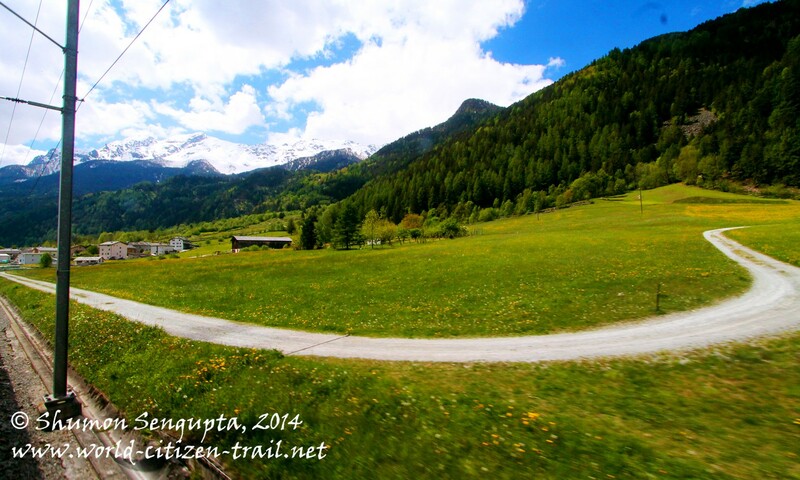 Trudging along alpine forests and meadows, climbing along the edges of steep narrow valleys, cutting through vast and desolate expanses of snow and ice, going past glaciers and glacial lakes, snaking along the shadows of soaring snow capped jagged peaks, by past sheer rock faces, raging mountain streams, rivers and cascading waterfalls, going through dark spiral tunnels drilled deep into the mountains, negotiating hairpin bends, curves and loops and soaring viaducts over deep chasms and gorges, our train eventually left Alpine Switzerland behind to reach the warmer climes and landscapes of chestnut trees, orchards, vineyards, palms, aquamarine lakes and Mediterranean like villages and towns, leading up to the beautiful town of Tirano in Italy on to the city of Lugano, back into Switzerland. 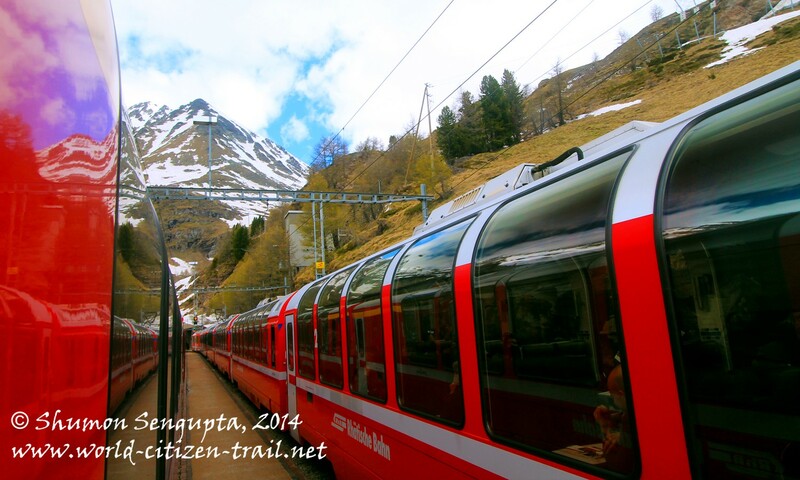 The Bernina Express train journey (4 hours and 13 minutes) followed by the Bernina Express Bus (3 hours and 10 minutes) represented a study in spectacular contrasts, in all its richness, natural and linguistic diversity, splendor and beauty.